Another fantastic recipe that makes me rethink my once negative stance on bell peppers. 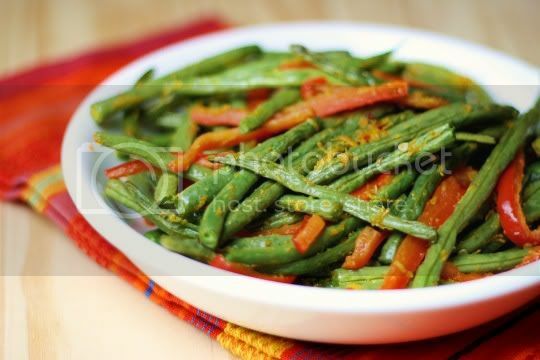 Paired with green beans, oven roasted, and covered in sweet and pungent orange zest, these are unquestionably delicious! This side dish is super easy to make, ready in no time, and easily doubled (because trust me, you'll want more)! 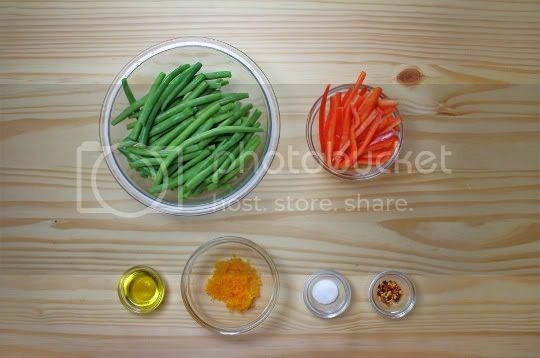 Simply toss together trimmed green beans and sliced red bell pepper in olive oil, salt, red pepper flakes, and orange zest. Spread on a baking sheet, bake for about 15-20 minutes, and you're done! A quick note about the green beans: roasting them raw for 15-20 minutes doesn't exactly yield tender beans. They will still have much crunch to them, and you may even think they're slightly tough. They will wilt, but if you want them to be more tender, try steaming them first for a few minutes. Or, you could try roasting them a bit longer before adding the bell peppers. Whichever way you decide, the finished dish has some amazing flavors. Salty, spicy, tangy, pungent, and slightly sweet, it's like the perfect vegetable flavor bonanza. Just 1/4 teaspoon of red pepper flakes gives the beans some surprising heat, so halve that if necessary. What I absolutely LOVED about the orange zest was that it seemed to mellow the harsh bell pepper flavor, making them alost sweet and fruity. And roasted orange anything is just sure to be delicious. In fact, I'd use orange zest again on oven-roasted veggies, and lemon might even be a good substitute as well. I'd definitely keep the bell peppers in the recipe, but adaptations to include broccoli, broccoli rabe, or tomatoes would certainly be just as satisfying. Make again? Definitely. I may use this method for brussels sprouts and the above-suggested broccoli rabe in the future. So addictive!!! I bet this would be great with carrots too.